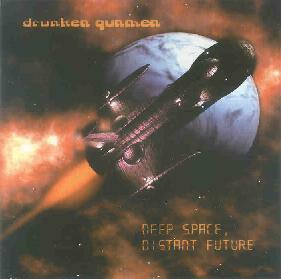 Drunken Gunmen - "Deep Space, Distant Future"
From Sydney, Australia, Drunken Gunmen are the duo of Graeme Kirk on guitars, programming, effects and vocals, and Chris McDowell on guitars and electronics. I reviewed their 4-song CDEP in AI #20 (all tracks included here) and a full length from these spacers is most welcome as they do an excellent job of bringing together elements of Hawkwind, Farflung, Monster Magnet and dashes of Ozric Tentacles into a tasty set of heavy space rock and electronic tunes. The album opens with "Journey To The Far Side Of The Sun", also from their CDEP. This is a nicely fuzzed, cosmically psychedelic, and totally stoned space rock song. It's like Hawkwind's Space Ritual with a Monster Magnet vibe. Excellent! "The Space Machine" is another standout track. It's a catchy song with the Gunmen's trademark stoner-space groove but also brings to mind Chrome. "Mr Moon" is probably the most accessible song, though it's just as spaced out as the rest of the album. "Fractal Parsecs" is another highlight track with a heavy THROBBING space vibe, pulsating Ozrics styled electronics, and a mind-bending groove that sails the astral waves. "We Are Visitors To Your Galaxy" is a very cool stoner space rocker and another one of my favorites. The song begins with an easy going drugged pace, including lots of cool UFO effects and a narrator telling the story. Then it launches into an alien stoner dirge that maintains it's stoned tempo but has a full and mucho potent sound, along with a bit of a Pink Floyd feel. The Gunmen are brimming with varied influences and it's all coming from the right places. "The Thousand Lightyear Stare" is a valium paced, spaced out drone-fest. I remember describing "Shiva's Descent" as "less than exciting" in my review of the CDEP, but hearing it with fresh ears I think it an excellent rocker with some of the most searing guitars on the album. "Cosmic Timebomb" is similar with more scrumptious ripping guitars. Finally, "Solar Traverse" and "Infused" are a little different, being more electronic and dancey than the rest of the album. The former is a space techno tune that's like Klaus Schulze with dance beats. And "Infused" is a space dancey tune with an 80's New Wav-ish feel. We gets loads of submissions at the AI offices but it seems like less and less truly cosmic and totally heavy SPACE ROCK comes our way these days. Drunken Gunmen are a welcome exception that fans of Hawkwind and generally heavy space rock will enjoy.